The NIAS-Lorentz Program is a collaboration between NIAS and the Lorentz Center set up in 2006. The program promotes cutting-edge interdisciplinary research that brings together perspectives from the humanities and/or social sciences with the natural and/or technological sciences. We hold that important and exciting advances are to be expected in research at the interface of different disciplines. Topics of societal importance, that require extensive collaboration across traditional scientific boundaries in order to progress, are encouraged. Pivotal to the NIAS-Lorentz Program is the understanding that scientific progress requires an open atmosphere that stimulates constructive interactions between researchers. The NIAS-Lorentz Advisory Board oversees all activities of the NIAS-Lorentz Program. The program is supported by the Royal Netherlands Academy of Arts and Science (KNAW), the Netherlands Organization for Scientific Research (NWO) and Leiden University. The Distinguished Lorentz Fellowship 2019/20 has been awarded to Hal Caswell, Professor of Mathematical Demography and Ecology from the University of Amsterdam. 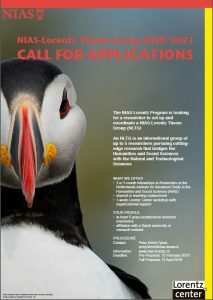 Proposals for NIAS-Lorentz Workshops or SSH Workshops are invited. More information here.